On 17 July, Langh Ship received final class approval from Germanischer Lloyd for its exhaust gas cleaning system on the vessel Laura. 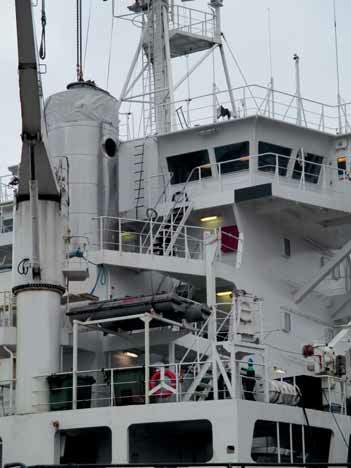 Langh Ship is a shipping company that has developed its own closed loop scrubber. The system uses caustic soda to neutralize the SOx in the exhaust gas and cleans the process water so that it can be led to the sea. The residual is collected in such a dry form that the compact waste can be easily transported to the nearest waste treatment plant. “DeltaLangh has already begun installing similar exhaust gas cleaning systems on our other four vessels. The installations are expected to be fully operational on 1 January 2015, when the new regulation comes into force,” says commercial manager Laura Langh-Lagerlöf, who herself has been actively involved in the development process. Langh Ship is a Finnish family-owned company whose goal is to stay at the forefront of technological development in order to serve customers as effectively as possible. For us, high technology helps us bear our share of responsibility for the environment. Langh Ship’s fleet comprises five multipurpose cargo vessels and the company has about 1,000 units of special containers mainly for steel carriage.